All transactions are safe and secure with a reliable history in online purchasing behind each of our associates. 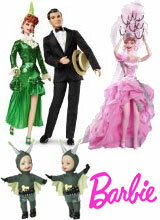 Buy the I Love Lucy Dolls and Barbies to own I Love Lucy clothing and merchandise. Lucy and Barbie have teamed up to create another perfect pairing, just like her and Ethel. These I Love Lucy Barbie Dolls feature the characters in some of their most memorable outfits, including the chocolate factory worker costumes, the Martian outfits, Vitameatavegamin Girl, the Operetta and more. In addition to the Ricky Ricardo Barbie doll, be sure check out the other figure sets that include Ethel dolls. Collect them all to capture the TV show's most hilarious episodes. In addition to the I Love Lucy Dolls and Barbies above, browse the I Love Lucy Clothing Gallery for more apparel like men's and women's clothes, kids shirts or hoodies.